2004 Mod of the Year Results ARE IN! Each year we see a flurry of 'Game of the Year' awards features. We have even seen some 'Mod of the Year' awards, however, they have often been small uneventful features, judged by a few biased reporters and limited to one game. Not anymore; 2004 marks the first year when the public who make and play the mods out there get to decide which are the best going round. The outcome will be interesting; will the next-generation mods on the next-generation engines prevail or will the old classics come through with the goods? Will the popular games with tons of mods win by masses of numbers, or will the games with a few mods fuelled by cult followings prove a force to be reckoned with? Well January 2005 has come and gone so the results are in! Each year we see a flurry of 'Game of the Year' awards. We have even seen some 'Mod of the Year' awards, however they inevitably end up as small uneventful features, judged by a few biased reporters and limited to one game. Not anymore; 2004 marks the first year when the public who make and play the mods out there get to decide which are the best going round. Hence the 2004 Golden Spanner Mod of the Year awards. 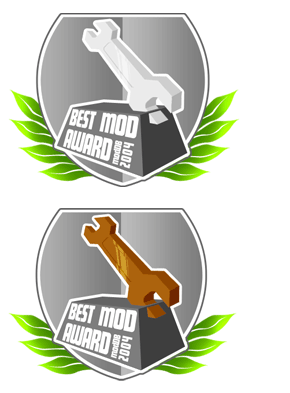 The biggest, best and ONLY real mod awards. Quite simply. You will notice every mod profile now has a 'voting box'. Registered members can vote for 1 mod in each category available. Note. You can change your vote at anytime, just nominate a different mod. At the end of 2004 voting will be closed and all votes logged will be tallied up and the winners announced. Rest assured we WILL find mods which have that "Wow, I nearly shat my pants!" factor. We are presently working hard to secure some competition sponsors so we can sort out some prizes for the mod teams to receive. If you are interested in sponsoring this comp and getting your company infront of millions of the smartest gamers going round, let us know. Get your mod on TOP! Want to give your mod the best chance of winning? Well then encourage your mods fan to come here and vote for it! To help you out we've put together a few promotional images your free to use and edit at will! Good luck, get voting and may the best MODS win! Awesome idea, INtense!! This will really seal the deal for modDB as the best resource for mods, though I personally have had those sentiments since I found it little under a year ago. Oh yeah, and read my PM(s). I'd bet that G4TechTV would either provide some short coverage, or do their own special on mods. OMG, INtense!, I love you so much for putting Cate into those competition banners. Rock on! Best game series EVER. omg liek I are teh excit0r. I thought it said golden spammer awards for a millisecond. Let's go see if The Battlegrounds is Nominated..
Yey at last :) shame my imagees didnt get used :( but no hard feelings..
Ooooh! Lookin' good! Perhaps I'll even get into a top 20 of sorts! That or see how many are NOT interested.. Heh, either way. This should be fun! I could try to see if G4TechTv would sponsor this Awards thing. I don't live far from them. So, I'll let you know Intense! If I get a good response. Why not keep a running tally of which mods are ahead? I think it'd be cool to see a continual competition leading up to the end of the year. I think it would be a lot more fair to categorize mods by game. Most gamers will be playing HL2 or BF1942 (or some variation). That means they are most likely to win such a competition, even though a mod for a game that isn't real popular could be much better. I agree in a way but it would be impossible to manage. I mean there are alot of categories available already. i mean these smaller games have more of a cult following so they maybe able to come through with the goods. Very cool :D The only thing that is bugging me is that it seems like the mod with the biggest community will win. Of course this mod is good, but there may be better mods around that are not very known. I agree with Dieblein, the website is not part of a mod... that's what I think. Your competition has just been officially announced over at PlanetDOOM! I'll be sure to throw my "hat" into the contest as I just released my very first mod on Halloween and the responses were quite good but more on that later...good luck everyone! and what do you think about this: Moddb.com ?? Its creative, but you need much more than creativity to make good videogames.